Throw open the windows and take in the view! 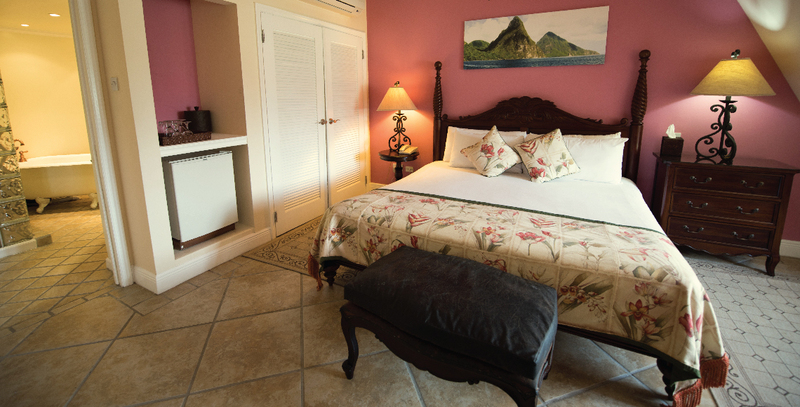 These family-sized suites overlook either Coco Palm’s oasis-style pool or the lush gardens and rolling hills of Saint Lucia. Located on the top (4th) floor with elevator access, the spacious suites features king size bed, bay window seating with 2 ensuite bathrooms and an additional bedroom with 2 twin beds. 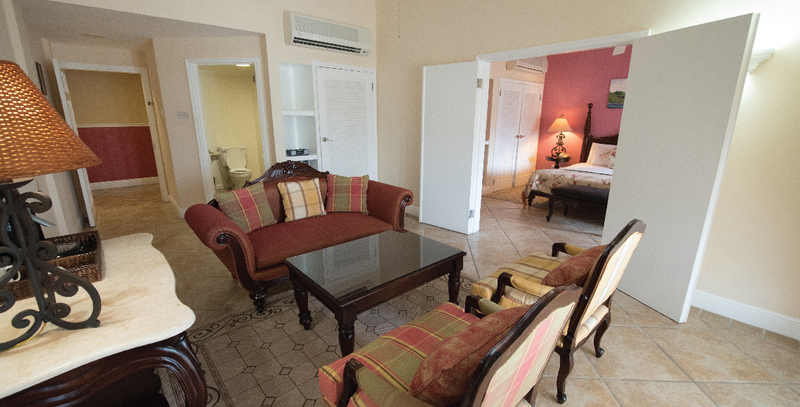 Suites feature 2 TV’s, iPod docks, cordless phone, safe, iron and ironing board and mini fridge. All ensuite tiled bathrooms feature granite vanity tops, hairdryers and illuminated magnifying mirrors. The glass walled shower is fitted with a seating ledge, sunflower ‘rain showerhead' and hand-held spray. Suites feature an additional bathroom with private toilet area, vanity tops, hair dryer, illuminated magnifying mirror and Victorian bathtub, double sink in master bath. 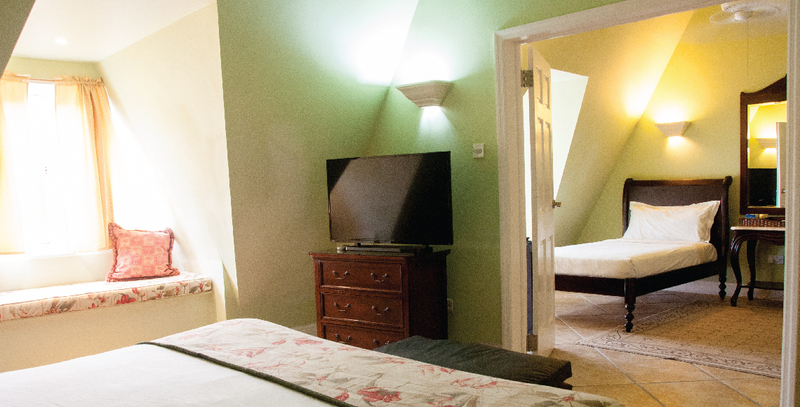 All rooms offer free high-speed Wireless Internet Access and dual voltage throughout. Whether you prefer our oasis style pool glistening below you, in the distance the marina at Rodney Bay, views of the blue Caribbean Sea, or a tranquil view of the lush rolling hills of Saint Lucia, Coco Palm Pool / Garden View Suites feature bay window seating, mini-fridge, luxury ensuite bathroom with walk-in rain shower and a Victorian bathtub. Living room includes French doors overlooking pool/garden, table for two, sofa, 2 Berger chairs, coffee table, Tru-flat TV (flat screen TV), spacious 660 square feet overlooking our pool/garden. These top (4th) floor suites have elevator access. 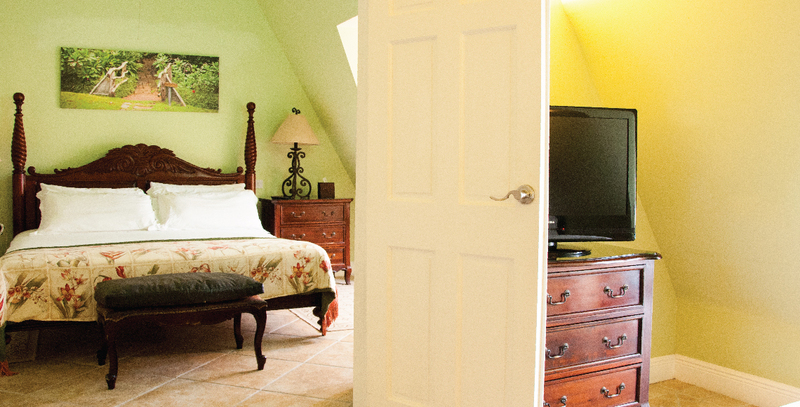 All rooms offer free high-speed Wireless Internet Access and dual voltage throughout.